I hated reading aloud in elementary school. I knew I wasn't as fluent as the other kids. I stumbled over the words, my face would always get red, and my body felt like it was going to overheat. In high school, I didn't have to worry about reading aloud, but I had to worry about longer and more complex literature that was hard for me to comprehend. I would read and reread and reread again. It took me four times as long as my peers to read the same text. These reading experiences in school convinced me that reading was not fun and my time was better spent playing outside, watching TV, or playing video games. 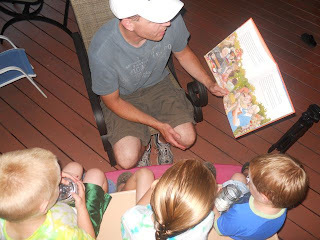 It wasn't until I began to read picture books as teacher that I started to enjoy reading. And it wasn't until I was a parent that I learned to love reading. Picture books to me are magical. They have the power to make us laugh after a day that was mostly filled with tears. They can bring us to tears after a day that was full of nothing but fun. They have the power to influence my family to converse about new topics, imagine new worlds, and create new experiences. Picture books have the power to teach us concepts, values, and important lessons. I know that, because of authors and illustrators like Patricia Polacco, my family will close each day with something magical happening. For this I am very thankful. Patricia Polacco has written and illustrated over 50 books including Just in Time, Abraham Lincoln (one of my daughter's favorites) and The Keeping Quilt. Her website states that her career began at the age of 41 when she started "jotting down the various stories that were rolling around in my head." Her mother pushed her to visit New York to present her portfolio to editors and upon her return home she received the news that she sold most of her work! Upon doing more research, I found that it might be more accurate to say that her career as a picture book author and illustrator began as a child when she used to make "fat cards" for her friend's birthday presents. Unable to afford gifts, Patricia would make wordless books all about her friends that were sewn and bound as books. (DreamJam World Interview, Clip 6). There are so many books that I could have chosen to focus on for a birthday celebration for Patricia Polacco. 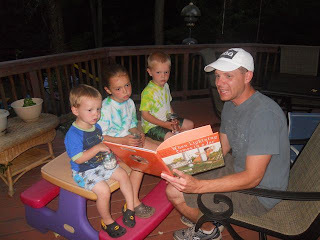 My children and I read the The Junkyard Wonders, Thank You, Mr. Falker, and The Art of Miss Chew, which I have nicknamed "The Must-Reads-for-Teachers Trilogy". All of these stories are true stories about Patricia as a child and her influential teachers. The Junkyard Wonders, makes me cry every time I read it, tells the story of a teacher Miss Peterson and her class of students with special abilities -- not disabilities. Together they learn that just because everyone else sees something as junk doesn't mean that it can't become something very special. Thank You, Mr. Falker, tells the story of the ridicule Patricia endured as a struggling reader and her journey to learning to read. The Art of Miss Chew tells the story of the teachers that recognized Patricia's talent for drawing and stopped at nothing to make sure art instruction was an important part of her education. All of these books are magical and should be read by anyone who works with children. Patricia Polacco said that it was her grandparents that showed her the magic in every day life. More specifically she said, "We used to watch fireflies come out of the ground in July. Miracle. Absolutely miraculous." (DreamJam World Interview, Clip 4). I thought catching fireflies with my children would be the perfect way to celebrate Patricia Polacco's birthday. However, there was much more excitement than I ever could have imagined from this simple activity. We prepared firefly catching jars with the help of Grandpa. We gathered three mason jars with lids from the garage. We used a hammer and an awl to poke holes in the lids. I was sure when my youngest son was using the hammer that something bad was going to happen. 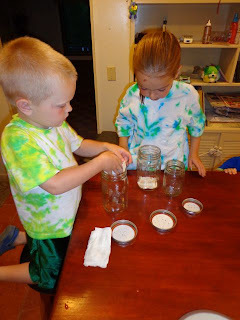 We the soaked a paper towel with water and placed it in the jar. This was recommended on Firefly.org to keep the air inside the jar humid for the fireflies. "When the sun was low and the shadows long" we sat on our deck to read When Lightning Comes in a Jar by Patricia Polacco. It is a wonderful story about the traditions that grew out of annual family reunions - wiggly jello, baseball games, looking through family photo albums, storytelling, and....catching fireflies. My kids held onto their mason jars during the reading of this book like they were prized possessions. 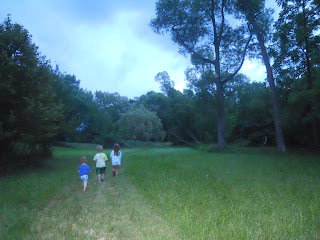 We headed to an open field near a creek that I thought would be a great place to find fireflies. 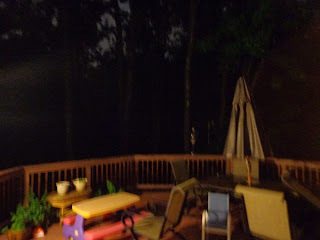 We were a little early, but it didn't take long for a few fireflies to emerge along the creek bed and near the trees. 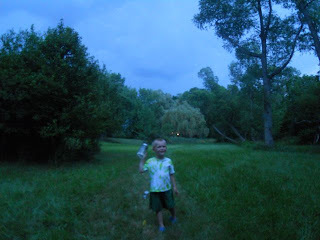 Initially, my kids were very excited about catching fireflies. 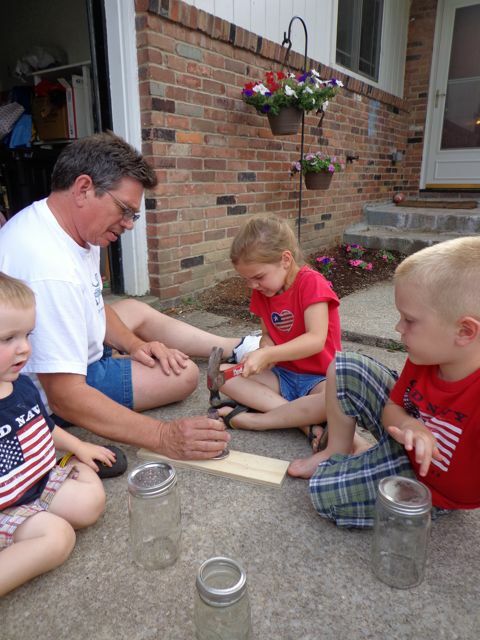 They were especially excited when we successfully added a few to their jars. 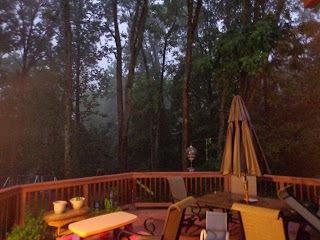 But...then a storm started to roll in -- lightning and thunder were in the distance. 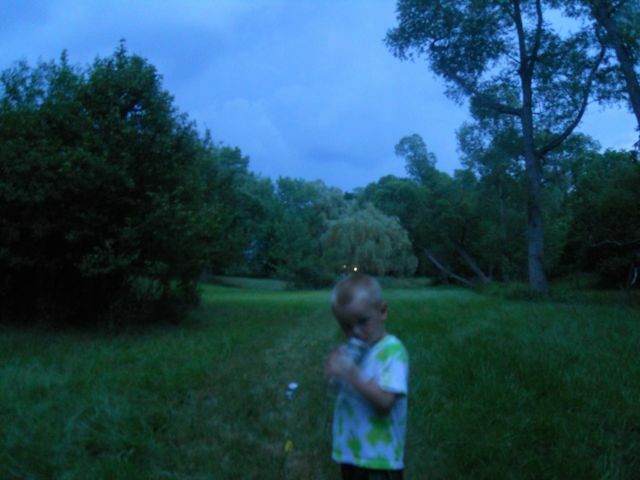 We managed to gather only about 10 fireflies before my son became scared and requested to go home. 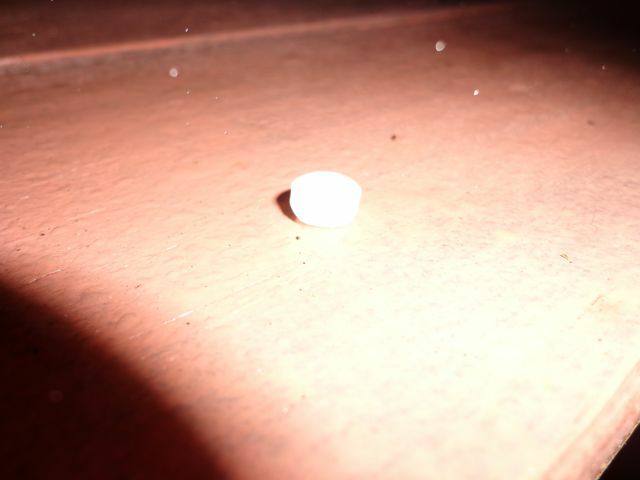 Luckily, we left when we did because as soon as we got home it started to hail. 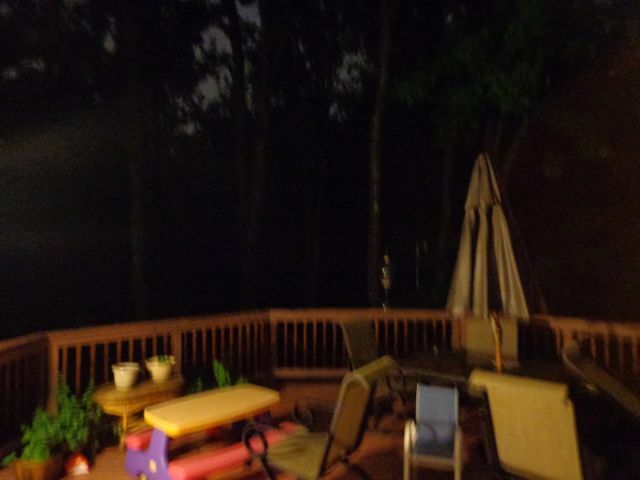 ...brightened with each lightning strike. My family safely watched the storm from our living room. The few fireflies in the jars were safely placed in the kids' bedrooms to watch over them as they slept. We may not have caught a large number of fireflies on this night, but it was an exciting and magical experience. 1. Patricia Polacco's Website - Lots of Lesson ideas! What fun! And next time there's a storm you can read her Thunder Cake. Happy Birthday to a great author/illustrator! Iza - Great idea! We even own that book! It is a good one! What a beautiful intro Eric. I was the same way as a child. Thank you for introducing Patricia Polacco with us. I'm looking forward to checking out her books. Happy birthday Patricia! Thanks Jennifer! Funny how the two of us had our issues with reading when we were younger and now we can't read enough children's books! I think you will really enjoy Patricia's books. I love her books! 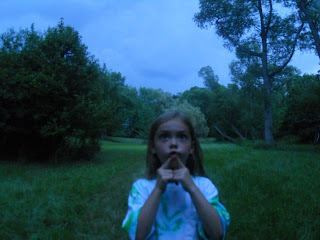 And I have great memories of catching fireflies as a child! Lori -- I remember catching fireflies being easy when I was a kid. It was really hard for me this time. I had a hard time finding them after they lit up. I guess I am getting old! I'm such a huge fan of Polacco's and even featured her on my blog too. I love the firefly catching to go with her book. There are so many great things about her. Thanks for sharing. Totally agree. I have enjoyed every book that I have read by Polacco. Thanks for stopping by the blog! I am a huge Polacco fan! Absolutely, Joanna! We can play and then read Polacco and then play some more!